Release Date: September 6th, 2006 (IFC Center) by IFC Films. BASIC PREMISE: A documentary about the life of Father Mychal Judge, a gay Franciscan priest who died in the rubble of the World Trade Center. 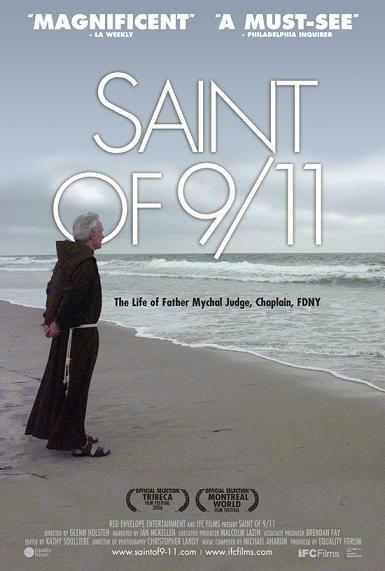 ENTERTAINMENT VALUE: Saint of 9/11 begins with the death of Father Mychal Judge on 9/11 and then backtracks to explain what makes him special. Interviews with his family, friends and colleagues portray him as a good person who cared greatly about others. He helped AIDS patients with his spiritual guidance and ministry during the 1980’s. Clearly, he means a lot to everyone around him. Judge had battled alcoholism and chose not to disclose his homosexuality to the FDNY firemen for whom he served as chaplain. Even though director Glenn Holsten does a decent job of making him a complex, fallible person, Holsten fails to humanize him for those who are unfamiliar with him. More information about his childhood would have helped as well as more provocative questions during the interviews. Moreover, the interviews seem a bit redundant, ho-hum, and dull. Saint of 9/11 suffers from mediocre editing that tends to make simple things quite irritating such as the way the name/description of the person being interviewed suddenly appears in four squares which are difficult to read. Ultimately, this documentary overstays its welcome at 91 minutes and, with more engaging interviews, it could have been much more powerful and memorable. SPIRITUAL VALUE: Some scenes feel moving such as when family and friends recall how he made an emotional impact on their lives. It’s comforting to know that he overcame his struggles with alcoholism which only made him mentally stronger. It would have been insightful to explore how he managed to become so saintly despite his sins. IN A NUTSHELL: Mildly engaging and occasionally moving, but ultimately dull, poorly edited and unmemorable.